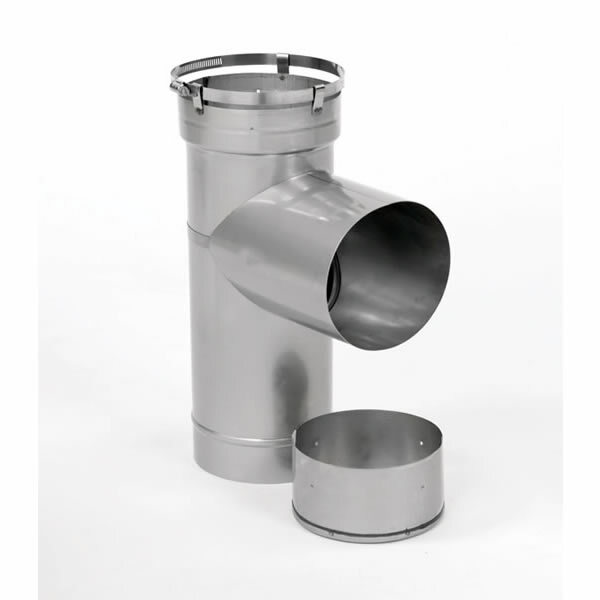 This tee section is designed for HomeSaver Pro-UltraPro 4 inch chimney liner pipe and is made with as much care as any HomeSaver product to ensure the best quality for you. The pipe is made from 18-guage, 304-alloy to guarantee durability throughout the years. Another great feature of HomeSavor's great product is a flared top that receives Pro. Approximately 18 inches in height with a removable 5 inch take-off; this might be the perfect pipe for you. Can I get a 6'' tee arm that goes to my stove that would connect to the 4'' tee? I do not recommend sizing it down to a 4 inch tee. This kind of downsize will cause a restriction and the stove will not operate properly. Your options are to use a 5.5 inch liner with no insulation or to use a tile breaker to remove the old clay tiles, giving you enough room to utilize the 6 inch liner that you have. I will be happy to answer any questions that you have, should you decide to pursue that route.